A NEW FESTIVAL. BY GEORGE! Home/A NEW FESTIVAL. BY GEORGE! Liverpool is to stage its first St George’s Day Festival on Sunday, April 21. The day long event will feature personal appearances in the city of children’s TV character Mike the Knight with historical entertainment from story-telling to dragons provided by medieval groups. The focus of the festival, which has been organised to promote the city’s historic St George’s Quarter, will be around St George’s Hall and St John’s Gardens which will also host a fun fair and various themed stalls including a hog-roast. Dragon inspired Superlambananas will take up residence in Queen Square with activities also planned for Williamson Square at the Liverpool Bandstand including performances by the community choir of the Royal Court. There will be a host of indoor fun too at the World Museum, Walker Art Gallery and St George’s Hall ranging from medieval arts workshops and story-telling to costume dressing and a knight’s trail. Children are being invited to attend the FREE event in fancy dress on the theme of Knights, Dragons and Princesses with prizes for under-10s and under-5s. Those attending in fancy dress will also be able to enjoy discounts at restaurants in Queen Square and discounted car-parking at Queen Square Car Park. 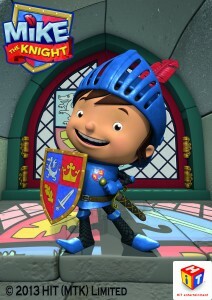 Liverpool’s inaugural St George’s Day Festival will begin at 11am when Mike the Knight will make a personal appareance. At the same time a very special dragon will appear on St George’s Plateau. The event is scheduled to end at 5pm. The celebration marks a momentous week for Liverpool with the city celebrating its inaugural Literary Festival – In Other Words – on April 23 to mark the re-opening of Central Library on May 17, which sits in the heart of St George’s Quarter. A new website will promote the quarter and further events are being planned to promote it’s offer. Liverpool City Council’s Cabinet Member for culture and tourism, Councillor Wendy Simon, said: “This will be the perfect way to celebrate the patron saint of England in an ideal setting – around St George’s Hall. It will be a packed day of activities, paving the way for the city’s inaugural In Other Words festival which is set to be a fantastic celebration of the spoken and written word. Liverpool’s St George’s Day Festival is organised by: National Museums Liverpool, St George’s Hall, City Central BID, Neptune Holdings, Royal Court, Holiday Inn, Marriott Liverpool, St John’s Shopping Centre and Culture Liverpool.